As always, we are going to place the call of our new subroutine, called DISPLAY_SETTINGS in the usual INITIALIZE_ALV subroutine. The DISPLAY_SETTINGS subroutine is responsible for two things: set the pattern of the rows to striped, and set the header of the ALV list. You can guess. 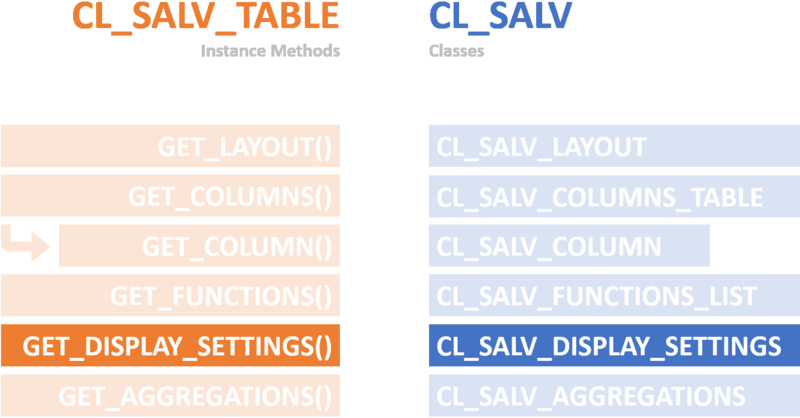 We are going to use the GET_DISPLAY_SETTINGS() method of the CL_SALV_TABLE class that returns back a reference to its CL_SALV_DISPLAY_SETTINGS object. Then, we are going to save this reference into a variable, called display_settings with the type CL_SALV_DISPLAY_SETTINGS. Next, we call the method SET_STRIPED_PATTERN() on the display_settings reference variable with the parameter true, and as a result, we get the rows with striped pattern. At last, we call the method SET_LIST_HEADER() on the display_settings reference variable that is responsible to set the header of the ALV list. Cool & Easy, isn't it? After running our program we get the following results: the title says 'Flight Schedule', and the rows are striped. That's it! :) I hope you liked it!